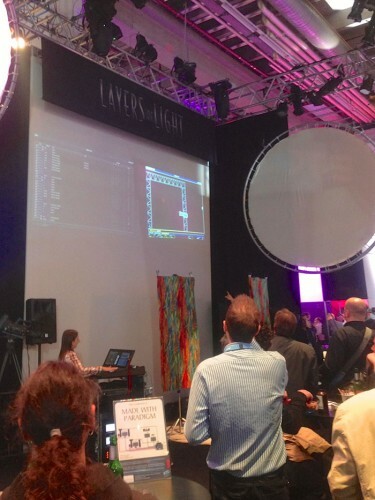 ETC showed a wide range of new and updated products at this year’s Prolight + Sound in Frankfurt. The launch of a new ETC lighting control desk, new software and new ETC lighting fixtures were a popular attraction; while stand visitors enjoyed regular live presentations from ETC’s Layers of Light Theatre. ES1 Dimmer, providing on board dimming for any brand theatrical luminaire. The Eos Titanium control desk (known as Ti) takes the place of ETC’s flagship Eos at the head of the product line, with new hardware and features that make designing and programming even easier. With hardware adapted from the design of the Gio desk, the desk now incorporates integrated, articulating, multi-touch displays, backlit keys and an anodised finish; and Ti includes a large multi-touch encoder display and dedicated pan and tilt encoders, in addition to the four pageable encoders. The desk also features 20 user-definable buttons, a backlit keyboard, motorised faders and multiple USB and video ports. Eos v2.0 also revises and improves the way it handles RDM for compatible devices. ETC is offering its first PC-based controller in the form of PC Congo. Based on the powerful Congo v6.4.0 software, this product allows a user to run Congo software on their own PC to control lighting rigs for shows or as a backup to other Congo family products. PC Congo can communicate with ACN/sACN devices and converters like the ETC Net3 Gateways for DMX distribution, show control and IO interfacing, as well as with ArtNet converters and devices. PC Congo also provides for many input options via USB such as the ETC fader wings or with third-party panels like X-Keys or other USB-MIDI fader/button panels. Following calls for a smaller, powerful Source Four, perfect for museums, restaurants and theatre lobbies where a regular fixture would be too much, ETC has released the palm sized 50W Source Four Mini. Designed with the DNA of the Source Four family, it combines crisp optics and crystal-clear image projection with a bright, even field and user-friendly operation. Optimised for on camera white light, the ETC Source Four Studio HD is designed to perform in a high definition production world where people (with varying flesh tones) need to look their best. The Studio HD combines exceptional light output with an ultra-flexible, variable white light (2700K-6500K), for more accurate colour rendition on camera. The ETC Source Four Dimmer, which was introduced at last year’s PLASA show, improves lamp efficiency and brightness, while eliminating the need for a separate dimmer room in the theatre. Now, the same technology can be fitted to any other brand of tungsten lamp, with the ES1 Dimmer. The ES1 powers loads of up to 1500 watts at 230 volts, or can also be set to power 750W loads at 120V, offering higher light output in 230V markets. And, as an RDM device, the ES1 Dimmer can be operated and managed remotely so that DMX addressing, dimmer curve changes and status information can be found at the lighting desk or computer. Last year’s Prolight + Sound saw the first ever Layers of Light presentations; this year saw the presentation refreshed, with the addition of ETC’s newest fixtures, demonstrating how they can work well either individually or together as instruments in a lighting director’s tool box. A second presentation showed how easy it is to set up a lighting system for a gig, making use of the new Magic Sheets function on the control desks and RDM technology, and demonstrating how ETC control desks, fixtures and power control products work together.